Canada closed the 2016 Ivan Hlinka Memorial Cup with a 4-3 win against Finland to finish fifth in the tournament. 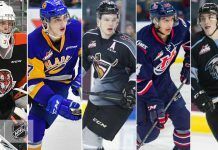 BRECLAV, Czech Republic – Michael Rasmussen (Surrey, B.C./Tri-City, WHL) scored the game-winning goal with 8:36 to go, giving Canada’s National Men’s Summer Under-18 Team a 4-3 win over Finland in the fifth-place game Friday at the 2016 Ivan Hlinka Memorial Cup. With the Canadians enjoying a two-man advantage, Owen Tippett (Peterborough, Ont./Mississauga, OHL) found Rasmussen at the side of the Finnish net, and he calmly went to the forehand to beat goaltender Ukko-Pekka Luukkonen from in close. Ian Mitchell (Calahoo, Alta./Spruce Grove, AJHL) scored twice and added an assist, and Joseph Veleno (Kirkland, Que./Saint John, QMJHL) chipped in with three helpers to lead the Canadian offence. Canada leaned on its power play in the win, converting three times in six chances with the man advantage. But it was the Finnish power play that got the scoring started, with Sami Moilanen finishing off a tic-tac-toe passing play by beating Canadian netminder Michael DiPietro (Amherstburg, Ont./Windsor, OHL) on a five-on-three just 5:04 after the puck dropped. Mitchell got it back for Canada with just 24 seconds left in the first period, taking a no-look drop pass from Veleno before firing a low wrist shot past Luukkonen for the first goal scored by a Canadian defenceman in the tournament. He added a second three minutes into the second period, taking another drop pass from Veleno before rifling a shot past a screened Luukkonen on a Canadian power play. Veleno played set-up man again on the 3-1 goal midway through the middle frame, finding Nick Suzuki (London, Ont./Owen Sound, OHL) alone at the face-off dot for Canada’s second power-play marker of the period. The Finns would cut into the Canadian lead with 4:58 left in the second period when Linus Nyman went five-hole on DiPietro on a breakaway, making it a 3-2 game after 40 minutes. Santeri Virtanen pulled Finland even six minutes into the third with another power-play goal, but Rasmussen’s winner less than six minutes later was the difference. Although its eight-year run as gold medallist came to an end, Canada improved its all-time record at summer under-18 tournaments to an impressive 85-13-6 (W-L-T) since first taking part in 1991.